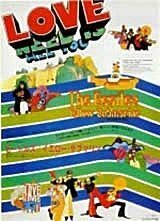 The Beatles made three feature length live action films and one animated film. They were A Hard Days Night, Help, Magical Mystery Tour, Yellow Submarine and Let It Be. The films were extremely light hearted spoofs which were often described as similar to Marx Brothers comedies. In describing the first film “A Hard Days Night” a new category, the mockumentry was coined because of its mad cap temperament. The films for the most part never received any critical acclaim they did enjoy moderate box office success however due primarily to the continuing Beatlemania. 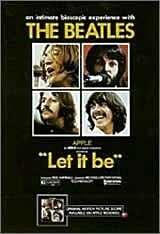 Let It Be won an Academy Award for Best Original Music Score. All of the films were named after an album and a corresponding single both of which were always released at roughly the same time. Below is a brief synopsis of each film and it’s release poster. A loosely directed look at two very hectic days in the lives of the four Beatles leading up to a London television appearance. It actually was shot over a 16 week period at a cost of $500,000 (cheap, even for 1964). The film received positive critical reviews. It showcased the groups light hearted side which much of their fan base didn’t realize. but had a much larger budget than its predecessor. The plot resembled a cross between a James Bond movie and “Duck Soup” by the Marx Brothers. Starting in Nassau, Bahamas and traveling through the Swiss Alps finally winding up back in the UK. were smoking pot and stoned for most of the filming. Originally made as a one hour TV movie and shown on BBC1 it was ill timed being released to compete with the holiday family shows. The film was made with virtually no script and was completely ad libbed as the shooting progressed. Filming took only two weeks but editing the totally chaotic scenes took eleven more weeks. The film was shown in B&W even though it was filmed in color which made it look very low quality. 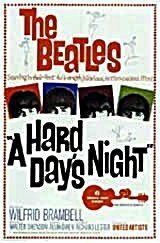 The Beatles said that they really enjoyed making the film even though the critics and the public hated it. This animated film which was produced around it’s soundtrack album and was the main reason for the film. 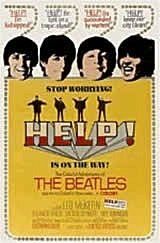 The Beatles were only seen in a cameo appearance in the closing scenes the rest of the film was voiced over by other actors. 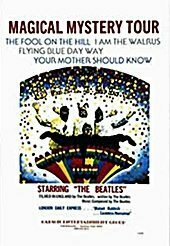 The film was very popular because it embraced the psychedelic pop culture of the time, the Beatles warmed to the movie over time. a collectors item if indeed you can find one!